Despite what the chill in the air says, it is spring! The Forsythia and Magnolia are blossoming, the snow has finally melted, and everyone is eager to get out and play in the dirt. A little bit of prep in the early gardening days goes a long way towards a trouble-free landscape through the rest of the summer. Raking away last autumn’s leaves and twigs and smoothing your garden beds is the first step. Any perennial weeds that might have been missed last season can be easily pulled out of the cool, moist ground before they have a chance to really dig in and grow for another year. Cleaning up Hosta foliage and other fall debris is essential for keeping pest and disease problems to a minimum. We also start to discover what may or may not have made it through the winter with the presence of tiny little green shoots, but don’t be too quick to judge; it is only April. Give everybody a few more weeks at least to wake up and feel the sunshine before deciding to dig them out. Summer and fall-blooming perennials can be lifted and divided this month, and anything that needs moving or transplanting can be done now. Early spring is also an excellent time to plant trees and shrubs. The sooner they get into the ground, the sooner they will start to set roots. Planting in the cool early part of the season also cuts down on the amount of watering that needs to be done. Remember, more work done in the garden during the cool months of the year means being able to enjoy it, rather than work hard, while it’s hot, hot, hot in the middle of summer. Plant some trees now, and enjoy the benefits all year, and appreciate the beauty of a well-grown shrub or perennial border while sipping iced tea in August. Spring is here, and it’s time to garden! Wendy Martin spends most of her days surrounded by boys. She has three of her own plus her husband, Scott. Scott was recently hired as the ranger for Camp Hinds in Raymond, so Wendy has taken on the roll of “camp Mom” for the hundreds of Boy Scouts who pass through the training center, which is attached to her house. 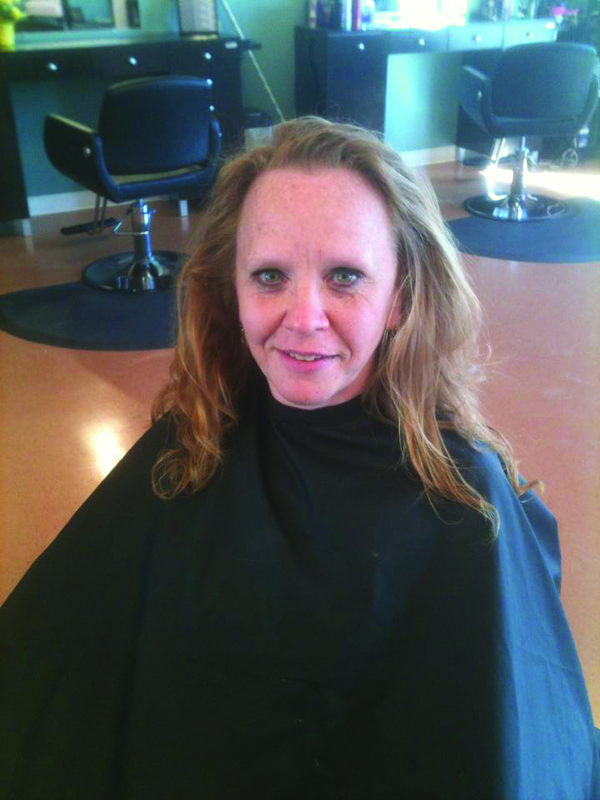 Her friend Jennifer Cole nominated her for the makeover, which The Windham Eagle and Chic Boutique were more than willing to do. 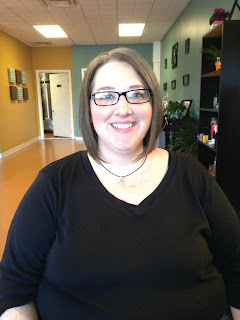 Stylist Jessica Corson did grey bending using demi-permanent hair color so the look would be easy to maintain. 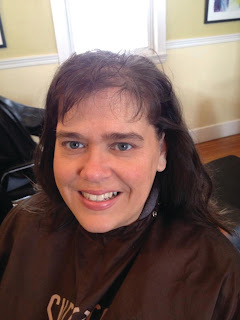 She also did a haircut that would look great when styled straight or left curly. She finished the look by shaping her eyebrows and doing a light makeup application to even Wendy's skin tone and enhance her natural beauty. Wendy said she was getting a lot of feedback. Sam Cole, son of Jennifer who nominated Wendy, asked “What did you do to your hair?” Wendy’s youngest son, Jonah, 10, didn’t want her to get her hair cut, but when he saw it he said, “Well, I like that hair cut. It looks good.” Her husband and sons Eri and Sam also rave about the new look, Wendy said. Her mother took a second glace and her dad didn’t know who was with Scott when they drove in their driveway. The best part of the makeover for Wendy? “Just taking a few minutes for myself to do something that looks nice and makes me feel fresh, we never pamper ourselves, or at least I don’t,” she said. Spring is well under way, and with summer close behind, it's time for our kids to get outside and get back to dreams of goals and home runs. We all take our kids' safety seriously, outfitting them with all manner of protective head and body gear. But we must not forget to also protect the safety of their teeth, jaws, joints and smiles. Traumatic injury to the mouth is a very real concern for our active, athletic kids and young adults. Since mouth guards began to be adopted in the seventies in high impact sports like football and hockey, the incidences of injuries in those particular sports have been greatly reduced. But if we don't protect them while playing other highly physical sports, like soccer, baseball and softball, we are standing at the sidelines waiting for the next accident to occur, and no parent wants to see their child suffer unnecessarily. A simple sports mouth guard can make the difference between an emergency and just another run scored. There are dozens of options for parents to choose from, including professional made and custom fitted options. Talk with your dentist about all the options available and ask for help in choosing the best option for yourself or your child, and if you already have a mouth guard in action, start the season out right by taking it in for a professional sterilization. Most dental practices will be happy to help you keep at least the mouth guard clean -- we'll leave the uniform sterilization to you and your detergent of choice! Nothing beats a healthy, happy, smiling young athlete. The 2013 Mrs. Maine-America Pageant was held on April 7 at Thornton Academy Performing Arts Center in Saco. Married women from all over the state competed for the coveted title. The crowning moment went to Mrs. Cumberland County Lisa DiBiase. Lisa and her husband Matt reside in Portland and have a 5-year-old son named Jordan. Lisa is the Owner/Realtor of Landing Real Estate in Portland. She also volunteers for the Events Committee for Greater Portland Board of Realtors and Habitat for Humanity as well as a columnist for The Windham Eagle. Lisa will represent Maine at the national Mrs. America Pageant this August in Tucson, Arizona. She will also spend her reign making appearances and volunteering for various organizations. Some of her first appearances will be at the Southern Maine Heart Walk in Portland on May 19 and the Greater Portland Board of Realtors Habitat for Humanity build in Freeport on May 30t. During her year long reign, Lisa will work with the City of Portland’s Recreational Department and focus on children in grades K-5, teaching them about being healthy and fit while having fun. For more information about the Mrs. Maine-America Pageant visit, www.mrsmaine.net. “Yes, dear. I’ll drop off your gym bag at school for you.” Or “Mom, I really need a pair of shorts in school colors for tomorrow.” So we jump in the van and head out to Olympia Sports, because the world will come to absolute end if she doesn’t get them. A mother’s love I call it, when we moms go out of our way for our children. Mother’s Day is a traditional holiday where Mom receives flowers that may consist of carnations, roses, daisies and some baby’s breath. How ordinary! My mom is anything but ordinary and I bet yours is too. Let’s take it up a notch and add some pizzazz. Ask your florist to place an unusual flower to the bouquet or arrangement - an orchid, a stem of Protea, or the latest trendy touch of succulents. Succulents will delight mom long after the blooms have faded. The succulent can simply be removed from the pick and planted into a container or ground. The added touch you give mom’s flowers will excite her. We know she is worth it. Remember mom washed that special shirt you needed for date night. Now it’s her turn to be someone special, and she deserves the best. Keep in mind the flowers will be remembered for years to come. Personalize the arrangement. Does mom like sparkles and shiny objects? Your local florist has many ways to add bling to any flowers you select. Maybe mom is down to earth. Birch bark, twigs and array of naturals can be added. Whatever mom’s style is, can be added to the flowers you select from the cooler. You local florist will be happy to make it one of a kind for Mom. Imagine the pride you’ll feel when mom sees the flowers you took precious time to select. Her face will glow and her heart will be filled with joy. She’ll share her excitement with other moms who ask her what she got this Mother’s Day. Make this year the year she brags about you and the flowers. 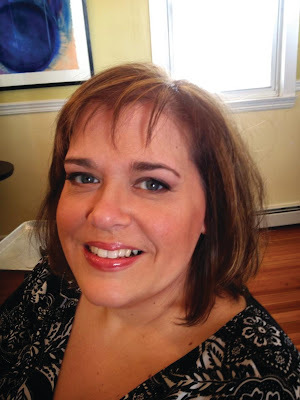 Pam Pattee is Maine Master Floral Designer, independent consultant, who lives in Windham. Smitty’s opened to a flurry of activity on Monday with an invitation only night to do a test run of the facilities. Three movies were shown and the families in attendance gave the front staff and kitchen staff a workout. 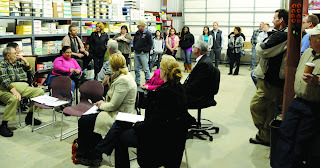 The opening for the general public was the next night with everyone who attended giving rave reviews. “Make sure to hit up Smitty's Cinema! I just got back and it brought me back to high school and the nights of hanging out at Chunky's (which turned into Smitty's, then closed). The tables are set up in stadium format so that you don't have to deal with other people right in front of you blocking your view. The best part is that the audio system in the theaters has been upgraded...Wow!” said The Windham Eagle foodie columnist Brian Rounds. According to manager Tucker Smith, he has started to limit the number of seats available for each showing to better serve movie goers. Go get there early. During spring, we anticipate new beginnings. We open windows and spring clean our homes and yards. Most of us don’t think about spring cleaning our energy systems or our relationships, but this is a perfect opportunity to address these through an exercise in self-love. On an energetic level, we are all connected to each other and to the Divine, God or whatever you choose to call it. Sometimes, we give too much of ourselves and don’t give enough to ourselves. To truly express ourselves with the spirit of love, we need to first learn to love ourselves. Americans struggle with the concept of self-love, confusing it with arrogance or selfishness. Love your neighbor as you love yourself does not mean to love your neighbor more than yourself. We are all meant to shine and as we let our light shine, we unconsciously give permission for others to do the same. The four things that will impede your progress toward self-love are: criticism, fear, guilt and resentment. It is easy to blame others for these behaviors, but then we remain victims. Every day we are given a new opportunity to create a powerful and positive future. I want to give you a couple techniques to shed the old negative self-talk and dawn a new life of positivity and pure love. First, I want you to make a list of all the things you like about yourself. I know, it is hard, but you can do it. Secondly, I want you to exercise forgiveness. Forgiveness is about letting go of the bitterness, anger and resentment within. Think about someone who has hurt you, sit quietly and repeat these words, “I forgive you now and forever and on all levels”. Do this for all the people who have wronged you. It will clear out a space in your heart and make space for more love. You will find the more you give love to yourself, the more you will be able to emanate pure love to others and spring will truly feel like a new beginning for your soul. Lisa DeFosse is a licensed massage therapist and Reiki master, who practices in Windham. She can be reached at columnist@TheWindhamEagle.com. Open burning in Maine and Windham requires an Open Burning Permit issued by the State of Maine through the Windham Fire-Rescue Department. The Maine Forest Service provides a daily weather advisory for fire departments from April through October. The Maine Forest Service refers to them as “class days.” The class days are prepared based on the dryness of the ground fuels, grass conditions, fine fuel moisture of the products on the ground, wind speeds, rainfall amounts and other weather factors. The class days are usually provided to the local fire departments via email between the hours of 8 a.m. and 8:45 a.m. The good days for open burning are referred to as a class 1 day, the next best day is called a class 2 day, which means it is okay but not the best of days to burn. Windham issues open burning permits on class 1 and class 2 days. This is followed by a class 3 day, which is a marginal day for open burning. A class 4 day is dangerous and Maine Forest Service advises that no permits be issued on these days. A class 5 day is issued when the forest service advises the governor that no open burning should be allowed because of extreme conditions and the governor issues a proclamation. Windham may not issue on certain days because of staff shortages, special events that are occurring, or situations where personnel are committed to department activities and there is no one to issue or approve requested permits. We do not issue fire permits on Thanksgiving or Christmas. People should read their permits carefully as they contain information that is important to the open burning laws. Maine Forest Service, Maine Department of Environmental Protection and the Environmental Protection Agency have had input on the rules and regulations of the open burning laws. There are restrictions on what can and cannot be burned in open burning. Some other factors that impact open burning are the neighborhoods. Some areas of our community have buildings that are very close to one another. The smoke causes a nuisance and aggravates health problems for the people that live in these areas. When these conditions are present Maine laws allows for local fire departments to prohibit open burning in the area of the problem. Windham has such areas in Brookhaven, Varney Mill Estates, Pinewood Acres, Tall Pines and an area on Cottage Road in East Windham. If you are unsure if you live in a restricted area, call 892-1912 or 892-1911 and we can provide you with the needed information. There are three ways that a permit may be obtained in Windham. One way is to go online to www.burningpermit.com, log on to the website, complete the form and submit the form to the department for approval. If your street is not listed in the street list then your area is not allowed to have open burning. This does not include propane or charcoal grills in the restriction. It does include cooking fires and campfires with wood products as the fuel supply. A second way is to go to the Maine Forest website and complete their form, which is the same as the Windham website, pay the fee for the permit and submit it to the Maine Forest Service for approval. The final method is to go to the fire stations and complete the form at the fire station. For open burning permits during the week, obtain them at either the North Windham Station or the Windham Center Station from 9 a.m. to 1 p.m. On the weekends, only North Windham Station issues the permits, because Windham Center station does not have access to the lobby to inform personnel that people are waiting. We are working to resolve this situation where a permit could be obtained at either Windham Center Station or North Windham. Please make sure you are in compliance with you permit requirements that are on the permit in fine print. Burning without a permit is a misdemeanor and wastes our emergency response resources and your tax dollars. The fire department does not want you to spend your hard earned money in the judicial system of Maine. This year as in past years, department personnel will be providing information on the first response for burning without a permit. If we are required to respond for a second incident then we will be requesting the Maine Forest Service or Windham Police to issue a summons for the appropriate violations. When a friend texted Parker Quimby and asked if he would compete in the inaugural Mr. Teen Maine pageant, Parker was a little hesitant. His initial skepticism quickly faded away. Someday, he’ll tell his grandchildren how he won that pageant. No stranger to the stage, Parker donned a black suit and red tie, demonstrated his personality by skipping across the stage, turning and pointing at the crowd. He also performed the death scene from Shakespeare’s “Romeo and Juliet,” and explained why he considers Abraham Lincoln a role model. Pageant contestants were required to answer an impromptu question on stage, perform, do a style walk demonstrating their personality and raise money for the Children’s Miracle Network (CMN). “It’s for such a good cause,” said Parker. Overall, the March 24 competition raised more than $1,000 for the CMN, and Parker raised $450 through a Facebook page and another website he created to generate funds for the competition. Relaxed in jeans and a T-shirt, Parker is affable and gracious as he describes the day of the competition. “I’ve done plays at school, but I’ve never done anything like that with that kind of writing,” said Parker. “It’s a very dramatic scene and it’s famous. People knew what it was about. They’ve heard about Romeo and Juliet, but I didn’t think they understood all of it. So, I gave some background and performed the scene,” he said. Parker has already been in two plays in middle school and is looking forward to continuing acting in high school. “I do sports, and I did some clubs. Then, in seventh grade, I tried out for a play and got a pretty good role,” he said. The week after the competition, Parker’s win was announced at his school, and the school librarian made a cardboard crown for him to wear. “I’m still getting congratulations, which is cool,” he said. Parker also keeps busy as a three-season track athlete. Then, there’s school. “I’ve always liked science and math. Physics has always interested me – I love atoms and subatomic particles,” he says. Contemplating a college career at Stanford or Yale, he says he can’t decide yet between the stage and physics. 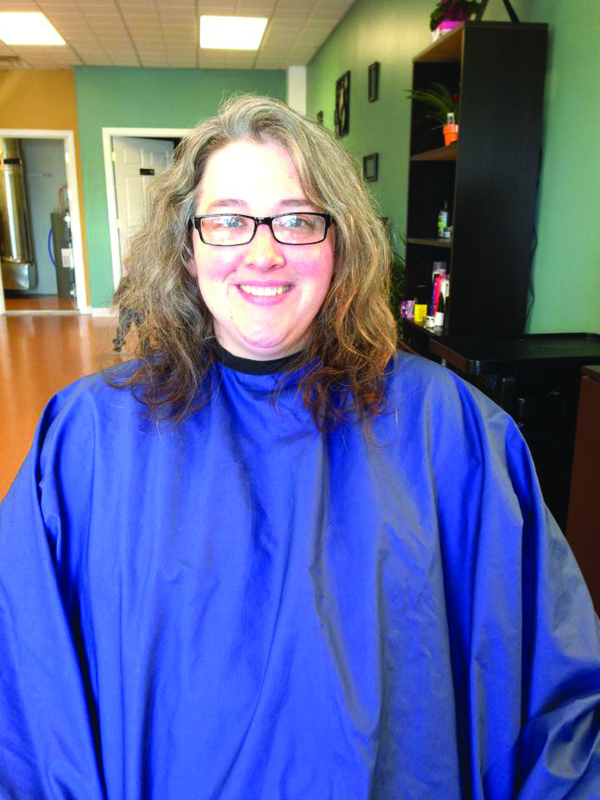 This week’s makeover began before The Windham Eagle even published its first issue. Laurie Shepard, an eldercare advisor, from Windham wanted to take control of her life and signing up for a makeover was one way to show the world what she has accomplished. In July 2012, Shepard had had enough of being overweight and she went to the Maine Medical Center Bariatric Center and made the decision to have gastric by-pass surgery. She had been diagnosed with polycystic ovary syndrome (PCOS), which is an imbalance in hormones that makes it difficult to lose weight and can cause weight gain, according to WebMD. “The imbalance kind of took over my body. I had hid behind PCOS,” Shepard said. When she knew she was going to have the surgery she immediately cut out caffeine, sugar and carbonation. She lost 45 pounds before her surgery. To date she has lost 129 pounds and her goal is to lose a total of 150 pounds. “It’s a certain mindset. I was never really an overeater,” Shepard said. After the surgery she was diagnosed with psoriatic arthritis and was unable to exercise although she did try a water aerobics class. She was told that success was healthy eating, lifestyle change and exercise. “Don’t miss any of those things,” she said. “I was treated incredibly nice there. It was a great day of pampering,” Shepard said. “I shortened her hair up, and added layers for movement. I lighten her all over color and added some soft highlights, then waxed her brows to show off her pretty eyes,” Chambers said. “I love it. I’ve gotten a ton of compliments on it. It meant so much with the whole process, it was really needed. I like the lighter color. I’d never had foil done before,” Shepard said. Her family, Linzell, her husband, and the children, Andrew, Owen and Aidan, decided that she still looked like herself, but different. Special thanks to Voila Hair and Day Spa for the Photos. Spring brings many opportunities for science competition, and students at Windham High School are ready for the challenge. A team of sophomores recently competed at the Science Bowl, and other students are gearing up for additional upcoming events. Jackson Giampino, Hawar Haddadi, Daniel Hanson, and Dexter Herald represented WHS at the Science Bowl, an annual Jeopardy-style competition, held at the University of Southern Maine in Gorham on March 2. Lisa McLellan, a chemistry teacher at WHS and the team’s coach, said that while the Science Bowl is an annual event, this was Windham’s first year competing. She learned of the event just a couple of months prior, mentioned it in a large chemistry class to gauge student interest, and the team emerged. While many teams had been preparing all year for the competition, the students from Windham had only a month. “This year, I told them that their goal was to have fun, to answer questions and not be afraid to get things wrong,” McLellan said. At the competition, the team put in a valiant effort, nearly winning their first round, winning their second, and coming very close again in two other rounds. While they also had a couple rounds that weren’t close, Windham was the only school with sophomores on their team. “The rest of the teams were either all seniors or mostly seniors with a junior here or there. These kids were taking on students who had much more experience in science and math, and did really well,” McLellan said. Two other science events are also ahead. This week, 30 students will participate in the American Chemical Society Chemistry Olympiad. The first round, a written exam, was taken at WHS on March 28. The top ten students in the state will qualify for the national competition, though only two students per school are allowed to compete at that level. WHS has competed in this event for seven years, and has had at least two students, sometimes more, qualify each year. McLellan was told that Windham is the only school who has had two students eligible to compete every year. She is hopeful that the trend will continue and Windham will have two students eligible for next month’s national competition. Finally, 30 students will participate in two teams at the Science Olympiad at USM in Gorham on Saturday, April 6th. McLellan and fellow coach Dan Wirtz have been working with students all year to prepare for this event. There are approximately 20 events including various build events, lab events and written exams. Each student participates in three or four events over the course of the day. Each year, the Windham team brings some medals home, and this year they are hoping to score in the state’s top three, a goal they missed by a small margin last year, McLellan said. It takes a dedicated student to compete in this type of event. They have spent many hours outside of class time in preparation. “These kinds of competitions really get kids excited about trying to learn new things,” said McLellan. Vitamin D (calciferol) is an essential vitamin used by the human body for balancing calcium and building bone as well as recent theoretical links to depression and pain. Whether Vitamin D has a direct link to our immune system, mood and pain receptors still requires additional research. We absorb Vitamin D from sunlight and UV light as well as consume Vitamin D in fortified foods. Vitamin D is found in milk, fish, cod-liver oil, bread, cereals and even eggs. There is inconsistency in the recommended amounts of Vitamin D. Part of that is due to variations in geological location (i.e. length of summer) and personal sunlight exposure. The Food and Nutrition Board, Institute of Medicine recommends infants 0-12 months receive 400IU (international units) daily, children 1-18 years 600 IU, 19-70 years 600 IU, >70 years 800 IU. Other sources with research focusing on potential links of low Vitamin D to increased depression and increased chronic pain, recommend up to 2000IU in 18-70 year olds. Here in the Northeast, we have limited hours of sunlight and summer months, thus low Vitamin D levels are common. Your doctor can check your Vitamin D level if there is a concern for complications of low Vitamin D. Those at risk include anyone with osteoporosis, a history of certain types of bone fractures and other medical conditions that put them at risk for fractures. Although the sun can provide us with natural Vitamin D, it is not recommended to get Vitamin D from the sun or a tanning bed due to the potential risk of skin cancer. Eating healthy foods rich in Vitamin D is your best course of action for healthy bones. If you are concerned about a deficiency ask your doctor if you should be tested for low Vitamin D. Before starting any Vitamin D supplement review your medications with your doctor. Almost forty people turned out to volunteer to resurrect Summerfest at a meeting held Tuesday night at the Time4Printing offices. Coordinator Kelly Mank and Ron Eby both spoke to the group, thanking them for helping to make Summerfest happen this year on June 22. “There are a lot of familiar faces here, who’ve done a lot over the years,” said Eby. “I’m no knight in shining armor,” he added saying that he wasn’t the only one keeping Summerfest running for the previous six years. Volunteers will be needed to work the parade route, handle set up and clean up and work with the committee chairs on entertainment and fundraising. Approximately 100 volunteers will be needed for that day. “Our basic goal is to create a community event. We need the community. It’s the community that needs to be involved,” Eby stated. Mank has spoken with the school about community service hours given to juniors and seniors at Windham High School for their help in the festivities, especially the parade route. Four girls from Windham Middle School attended the meeting. They approached Eby about a bake sale they are planning for this weekend at Aubuchon Hardware to raise money for the event. “That’s the spirit Summerfest was built on,” said Eby. The scope of Summerfest will change. It won’t be exactly the same, according to Mank. However, cancelling it outright was on an unacceptable option. The town involvement is necessary and they are on board, said Mank. “Let’s keep the town out of the middle and make it as easy for the them as possible,” she said. Windham Historical Society will have an “artisans on the green” day from 9 a.m. to 3 p.m. They would like to have local artisans come and show how they create their art, from wool spinning to butter churning. Julie Arsenault is in charge of the entertainment committee. “We want it jammed packed with fun for everyone,” she said. Director of Windham Economic Development Tom Bartell confirmed, “It will be a town event. We will organize parking and logistics and we will do that to ease the burden of these people,” he said, pointing to the gathered crowd. The car show, the helicopter rides and the Chamber Singers 25th Anniversary concert will also take place that day. “I can’t think of a better time to bring back 25 years of singers on a day we celebrate our community,” said Dr. Rick Nickerson, director of the Chamber Singers. Webelos Scouts from Pack 805 held their crossover ceremony last week at Windham Middle School to celebrate their passage into Boy Scouts. The boys, many of whom have been in the program for four years, crossed the bridge with their parents to graduate into the Boy Scout troop of their choice. They were met with camaraderie by older Boy Scouts who welcomed them to the troop. Crossing into Windham Troop 805 were fifth graders: Dean Preston, Aiden Day, Tyler Lewis, Ezra Stevens, Clay Hatch and Logan Williams. Crossing into Windham Troop 51 were fifth graders: Luke Tarbox and Sam Medina. Paul Preston, Assistant Scoutmaster of Troop 805, and Leader of the Webelos 2, said that Boy Scouts has done a lot for his family, and is gratified to see boys continue in the program. “The Scouting program has been a way to bring my family together with others in the community. 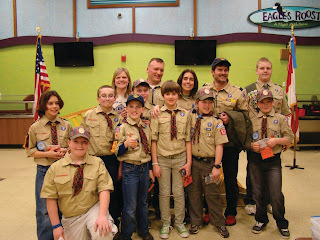 By setting goals and getting outside through Scouting, we have helped our boys grow into responsible citizens,” he said. “Helping these boys grow into caring young men has been extremely rewarding for me. Through the scouting program we teach our children leadership skills, safety skills and core values while having fun doing it,” Preston continued. Boy Scout Dean Preston, who recently crossed over, agrees. “The best part about scouting is that you can do a lot of cool activities with your friends and you can have fun and get work done that helps you later in life without knowing. You get tricked into learning stuff!” he said. “As a boy scout I am looking forward to taking the experience of Scouting up a level like we did two weeks ago when we learned how to build a quincee (snow cave) for outdoor survival,” Dean continued. Windham Primary School noon monitor Maggie Libby was eager for a change. She hadn’t had her hair cut in two years and she’d never colored it. 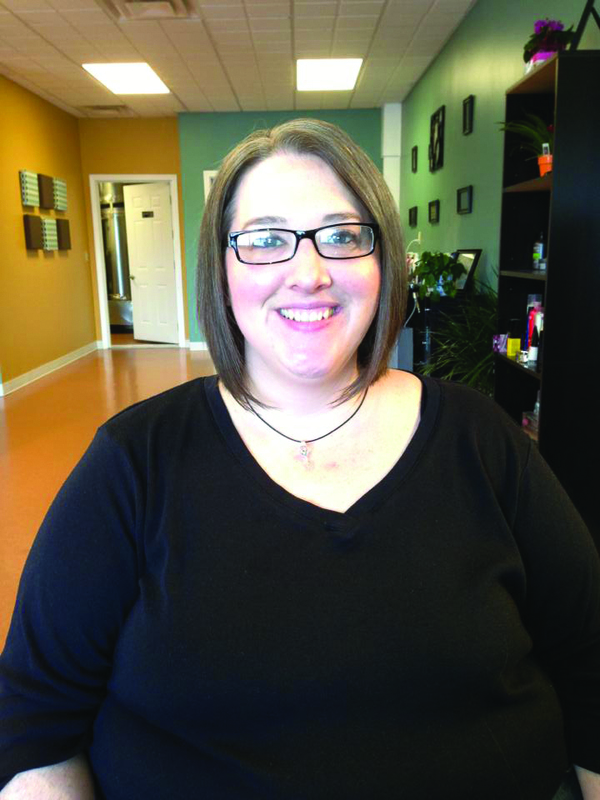 When she arrived at Chic Boutique, 889 Roosevelt Trail, those things weren’t on her mind. She wanted to donate her hair in honor of Deliah, a 2-year-old daughter of Windham Primary School physical education teacher Stacey Turkington, who is battling Leukemia. “She’s been fighting for at least over a year,” Libby said. 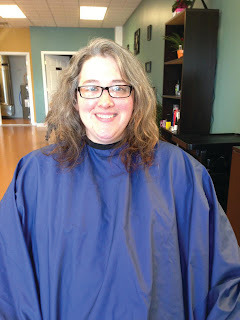 The hair was donated to Pantene Beautiful Lengths program to be made into wigs for people fighting cancer. Libby only had one request for her new look. She wanted something with easy maintenance. “I absolutely love it. I was open to anything,” she said. Owner of Chic Boutique Barbie Smart-Damen added more intense copper and gold tones to play up Libby’s already beautiful auburn hair. 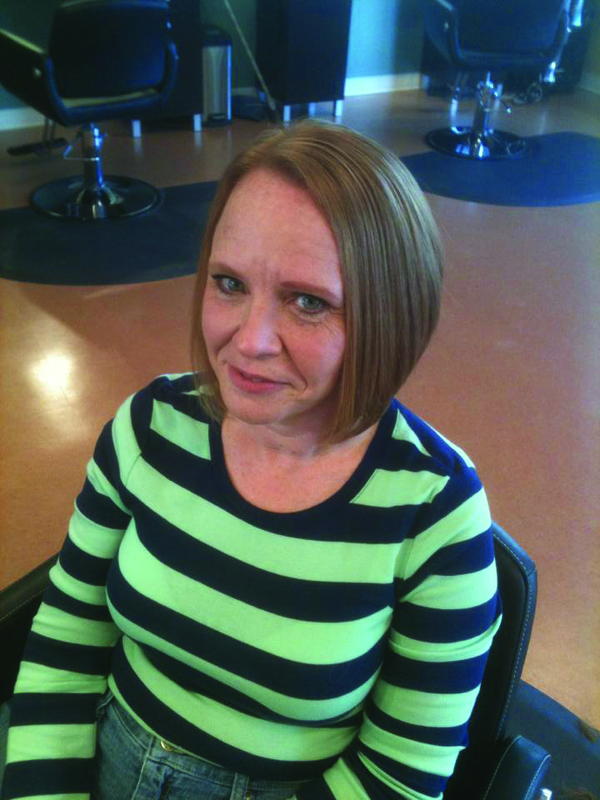 She then took about 12-inches off the length so she could donate it and gave her a modern look with a graduated bob. 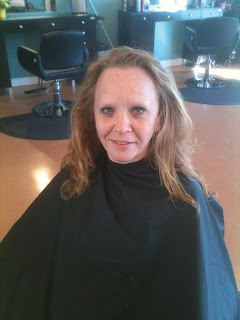 To finish off the look she did a light makeup application. At home, her husband Rob and two daughters, Abbi and Julia loved it. The girls wanted to play with it, she said. Libby wants to keep up with the look definitely through the summer. 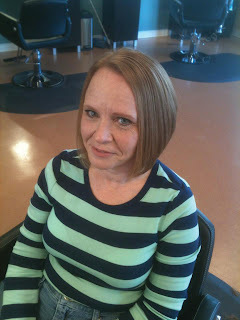 “It looks just as good today s it did from the salon,” she added. Over 300 people packed into Applebee’s in North Windham March 21, to celebrate World Down Syndrome Day and raise money for their programs. Through Applebee’s Dining to Donate program, the Maine Down Syndrome Network earned 15 percent from the diners’ tabs. “We wanted a restaurant that was family friendly and available,” said Maine Down Syndrome Network president Jen Greslick, who was there with her daughter Mary. “Applebee’s has been awesome,” she said. She added they would have done something anyway to mark the date. Madilynne Small, 3, celebrated with her family Parker Cook, 11, Cathy Cook, Faith Cook, Grace Morgan, Bob Cook, Missy Morgan and her mom Elizabeth Small and sister Bailey. Madilynne earned the most money at the annual Buddy Walk last September and has earned the spot on all of the Maine Down Syndrome Network publicity items. For more information, visit www.dsmaine.org.